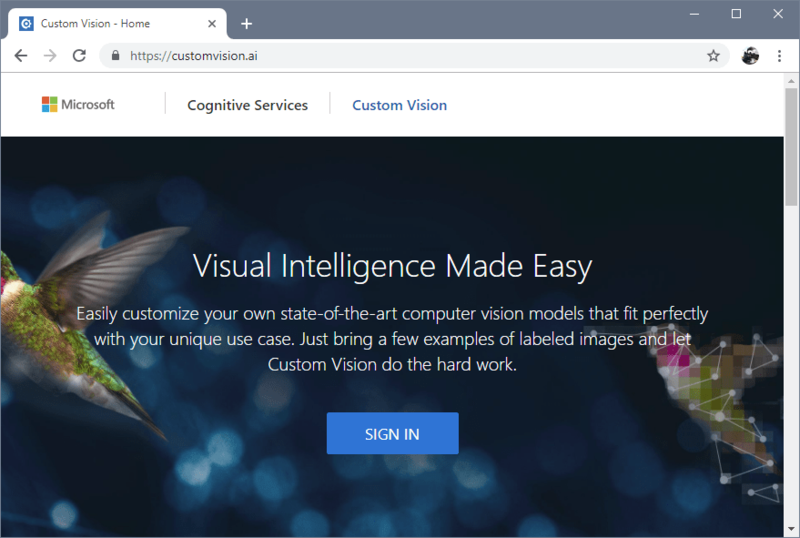 什么是 Azure 自定义视觉？What is Azure Custom Vision? Azure 自定义视觉是一种认知服务，用于生成、部署和改进你自己的图像分类器。Azure Custom Vision is a cognitive service that lets you build, deploy and improve your own image classifiers. 图像分类器是一种 AI 服务，可以根据视觉特征为图像应用标签（代表类）。An image classifier is an AI service that applies labels (which represent classes) to images, according to their visual characteristics. 与计算机视觉服务不同，自定义视觉允许你确定要应用的标签。Unlike the Computer Vision service, Custom Vision allows you to determine the labels to apply. 自定义视觉服务使用机器学习算法为图像应用标签。The Custom Vision service uses a machine learning algorithm to apply labels to images. 你作为开发人员必须提供多组图像，其中包含或缺少相关的特征。You, the developer, must submit groups of images that feature and lack the characteristics in question. 请在提交时自行标记图像。You label the images yourself at the time of submission. 然后，此算法会针对该数据进行训练并计算其自己的准确度，方法是针对这些相同的图像自行进行测试。Then the algorithm trains to this data and calculates its own accuracy by testing itself on those same images. 训练算法以后，即可对其进行测试、重新训练，并最终使用它根据应用的需求对新图像分类。Once the algorithm is trained, you can test, retrain, and eventually use it to classify new images according to the needs of your app. 也可导出模型本身，方便脱机使用。You can also export the model itself for offline use. 可以将自定义视觉功能分为两种功能。Custom Vision functionality can be divided into two features. 图像分类可将一个或多个标签应用到图像。Image classification applies one or more labels to an image. 对象检测与之类似，但还在图像中返回坐标，坐标中可以找到应用的标签。Object detection is similar, but it also returns the coordinates in the image where the applied label(s) can be found. 自定义视觉服务经过优化，可以快速识别图像之间的主要差异。The Custom Vision service is optimized to quickly recognize major differences between images. 这样你就可以开始使用少量的数据对模型进行原型设计。This allows you to start prototyping your model with a small amount of data. 开始时，每个标签通常可以包含 50 个图像。50 images per label are generally a good start. 但是，这意味着此服务不适用于检测图像中的细微差异（例如，在质量保证方案中检测细微裂纹或凹陷）。This means, however, that the service is not optimal for detecting subtle differences in images (for example, detecting minor cracks or dents in quality assurance scenarios). 另外，可以从多种自定义视觉算法中进行选择，这些算法已针对包含某些主题内容（例如特征点或零售商品）的图像进行了优化。Additionally, you can choose from several varieties of the Custom Vision algorithm that are optimized for images with certain subject material—for example, landmarks or retail items. 此方面的详细信息，请参阅生成分类器指南。See the Build a classifier guide for more information on these. 自定义视觉服务以一组本机 SDK 的形式提供，另外也可通过自定义视觉主页上的基于 Web 的界面来获取它。The Custom Vision Service is available as a set of native SDKs as well as through a web-based interface on the Custom Vision home page. 可以通过一种或两种界面来创建、测试和训练模型。You can create, test, and train a model through either interface or use both together. 与所有认知服务一样，使用自定义视觉服务的开发人员应该了解 Microsoft 针对客户数据的政策。As with all of the Cognitive Services, developers using the Custom Vision service should be aware of Microsoft's policies on customer data. 请参阅 Microsoft 信任中心上的“认知服务”页面来了解详细信息。See the Cognitive Services page on the Microsoft Trust Center to learn more. 按照生成分类器指南操作，开始在 Web 上使用自定义视觉，或者完成图像分类教程，以便实现代码中的基本方案。Follow the Build a classifier guide to get started using Custom Vision on the web, or complete an Image classification tutorial to implement a basic scenario in code.